Boots. Charles Dane, designer (in business c. 1990). Paris, 1990-2000. Leather, glitter, metal, wood. Gift of Stephen K. Desroches. 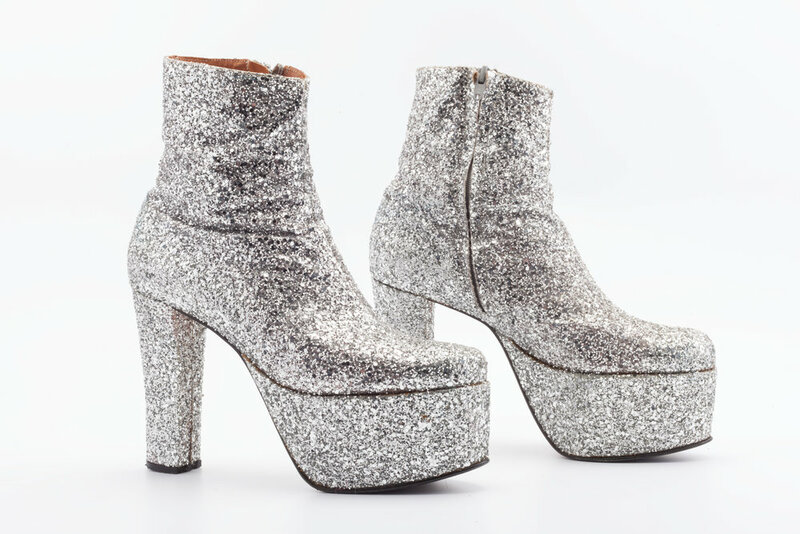 This exhibition showcases hats and shoes worn in New England from the 1750s to the 1980s. Often the most luxurious and decorative aspects of dress, hats and shoes reveal fascinating stories about social status and personal style. These rare and stylish survivals survey New England’s notions of glamorous dressing for men, women, and children. Head to Toe also investigates the production of these goods and their effect on New England’s economy, workforce, and environment. What effect does the fashionable image have on our self- perception? Who could afford these objects? Who made these goods? Who makes them today? A second group of objects provides necessary contrast to the fashionable pieces: Work boots, hard hats, concealed shoes found in attics, and a pair of shoes worn by Julia Child illustrate how everyday dressing, for work or comfort, often trumps fashionable heels and ephemeral materials. This exhibition is supported in part by our lead sponsors, Susan P. Sloan and Arthur D. Clarke, with additional support from Coby Foundation Ltd. and Dr. Janina A. Longtine.